Jim McDade, Photographer – Page 31 – We don't "take" photographs. We are "given" images. And, if we're lucky, we get to capture and hold them for a little while. With all the hot and humid weather we’re having, the problem of condensation when we take a camera from indoors – air conditioning – outside, raises the question: how to prevent your camera and lenses from fogging. Sometimes, it can take half an hour or more for a lens to acclimate – and for the fogginess to disappear – so that it can be used. Recently, I came across this question in a six-year-old edition of Outdoor Photographer magazine. The answer, given by long-time OP columnist, George Lepp, is an idea I had never heard … but from now on I’m going to use it. All you need is a plastic zip-lock bag large enough for your camera and lens and some silica gel. Put the equipment inside the bag with the desiccant as soon as you take it into the air conditioning. Then, when you go out into the heat and humidity, give the package a few minutes to adjust before trying to use it. Most of the accumulating moisture will gather on the outside of the bag, and the silica gel should take care of the small amount that’s inside the bag with the camera. And one more thing: These extremes of temperature and humidity can also damage your camera and lenses. Moisture accumulating inside any electronic equipment is not good. More expensive cameras and lenses have much better seals and structural integrity than the ones most of us can afford to use – that’s one reason they’re more expensive. 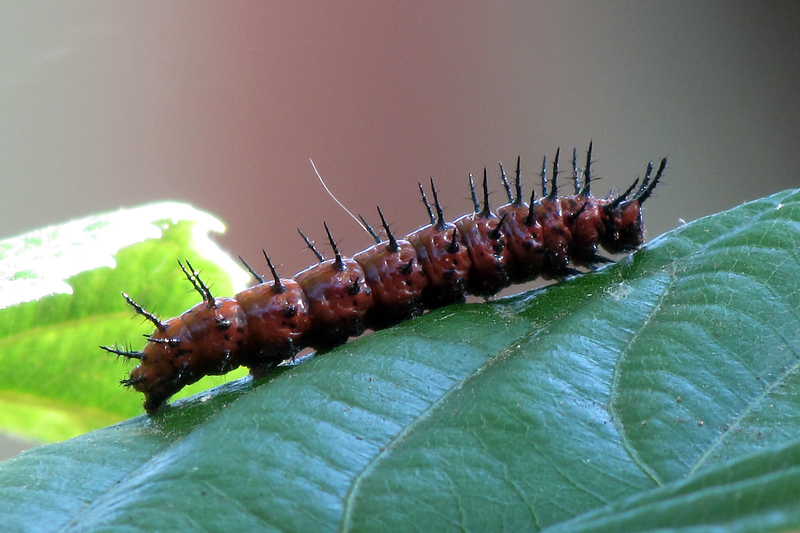 To the best of my knowledge, this is some kind of Fritillary caterpillar. I captured this image with my Canon SX30is, using digital zoom at 75x. I don’t usually use or recommend digital zoom. It gets real ugly real quick. But this camera is amazingly good at it. The 75x setting approximates almost 1700mm in regular camera terms. Click on the image to enlarge and see full detail. It’s June 2012. Actually, the 27th – which would have been my dad’s 106th birthday. So what better time to re-launch my presence on the internet? To share this adventure with you, inviting your comments, questions and general frivolity! I’ll also share links to my own Constant Contact weekly offering. If you’d like to follow, please do.